Bridget’s last report card showed high grades in math and science. She told me her favourite subjects are science and art. 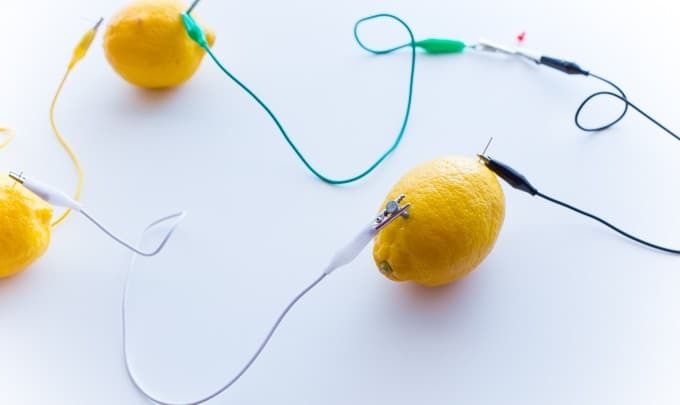 I’ve been looking for ways to nurture her interests and thought making a lemon battery was a great idea. This is a sponsored conversation written by me on behalf of Green Works. The opinions and text are all mine. Art is easy to find fun activities. It’s a little trickier with science. 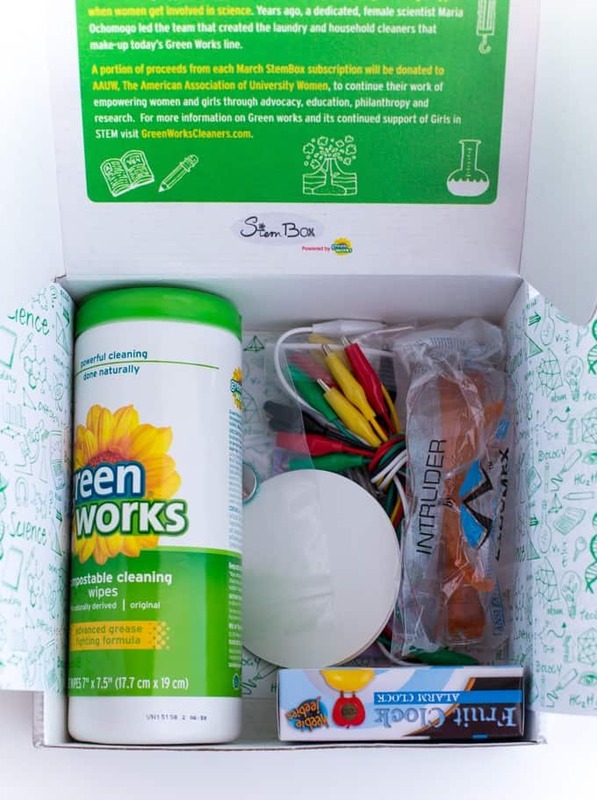 That’s one of the big reasons why I’m happy to see Green Works partnering with StemBox, a monthly subscription service for girls ages 7 to 13. Their focus is on science experiments and concepts to explore STEM (science, technology, engineering, math). 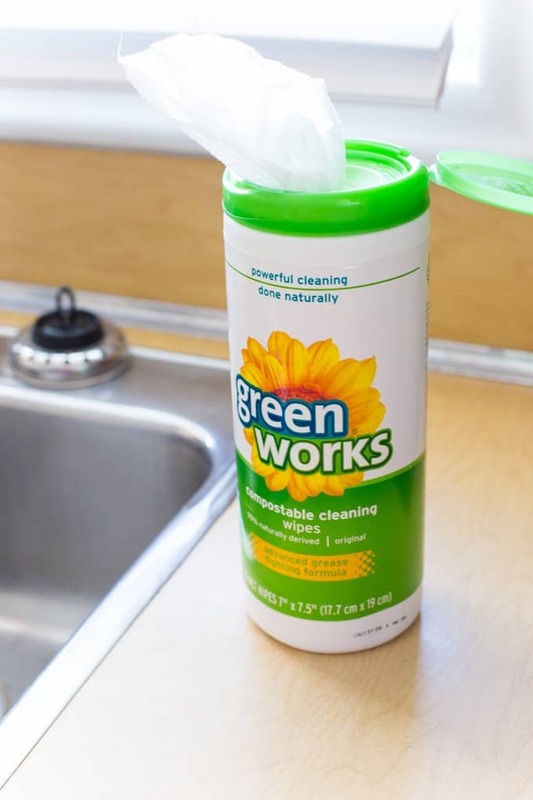 Green Works cleaners are a regular fixture in our home. I appreciate their naturally sourced ingredients and that they can handle my tough cleaning jobs. It’s great to see them inspiring future generations of female scientists through this initiative. As a quick side note, did you know that a female scientist named Maria Ochomogo was the leader of the team that created the household and laundry cleaners that are the Green Works line of products we use in our homes today? Pretty neat. We’ve never had a delivery quite like StemBox! After opening the box and seeing what our STEM experiment would be, I was just as excited as Bridget to get started. It’s been decades since I’ve done science experiments and I’d forgotten how fun they are. 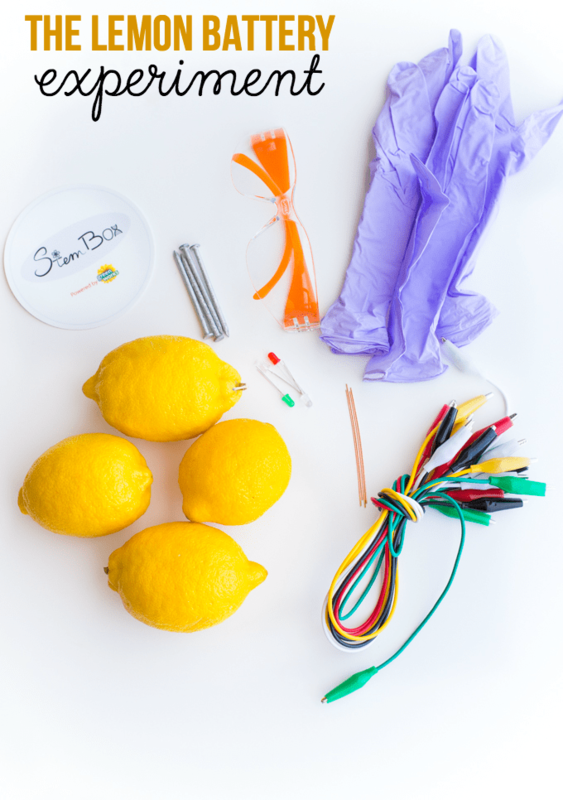 We were going to make lemon batteries! 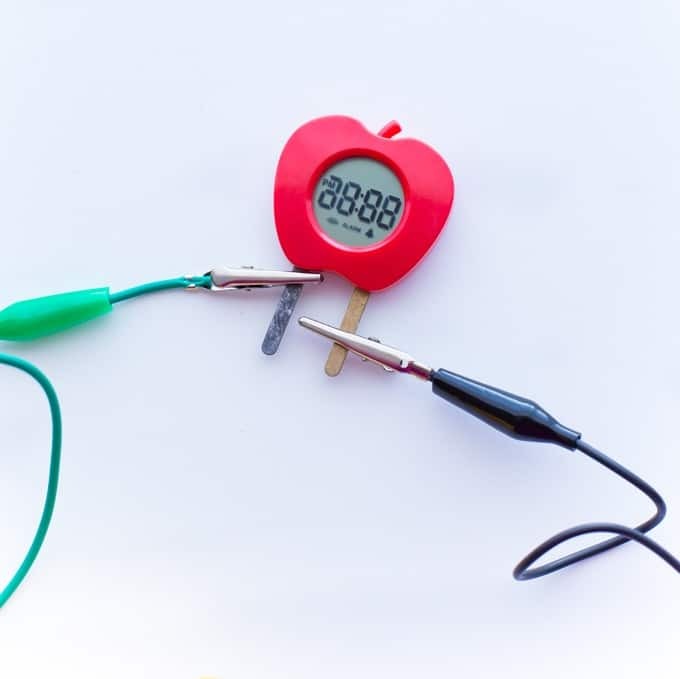 Bridget informed me that she knew that you could use fruit to create electricity and didn’t I know that you could charge a cell phone with an apple? I told her let’s start with lemon batteries first! I like that she’s ambitious though. She’s a smart cookie. The only items I had to pick up were four fresh lemons. The StemBox contained everything else Bridget would need to conduct the experiment. I love that the first step focused on safety! Let’s roll. Literally. 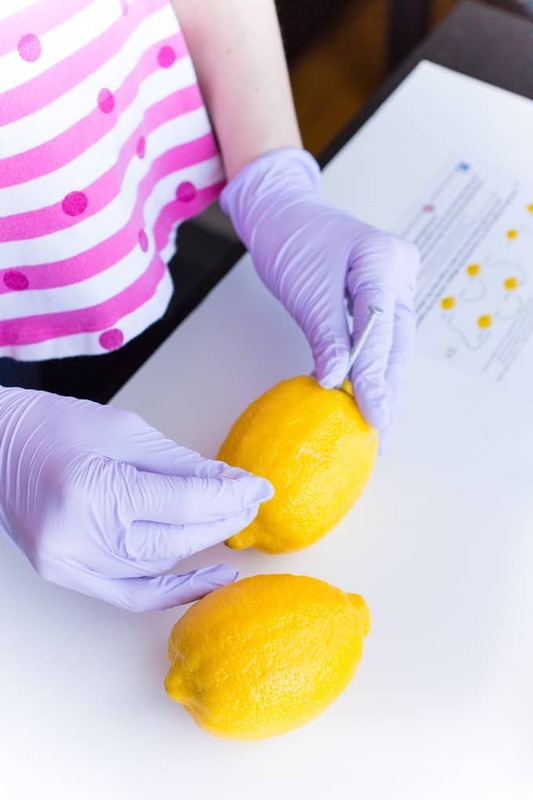 Bridget’s next step was to roll the lemons to break up the juice inside. 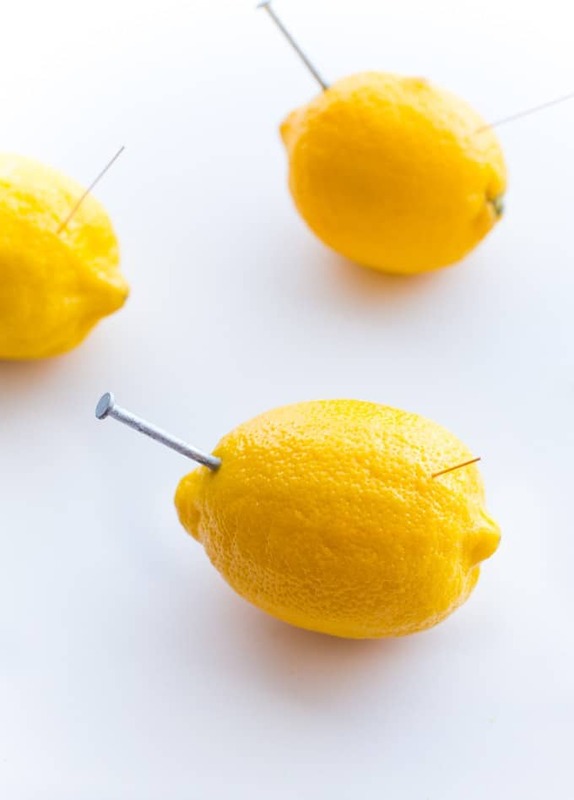 Then she placed a zinc nail and a copper wire on opposite sides of each lemon. In batteries, you need an anode, a cathode and an electrolyte. Here the lemon juice is the eletcrolyte, the zinc nail is the anode and the copper wire is the cathode. They connect to each other with alligator clamps. The last step is connecting your LED bulb to the alligator clamps and watch it light up! It’s hard to see in the photo in the bright daylight so I wanted to demonstrate with this mini clock that came in the StemBox. The lemon battery experiment was a success! Who knew lemons were so powerful? Bridget thought it was pretty cool and I was impressed myself. I had no idea that you could do this with lemons! 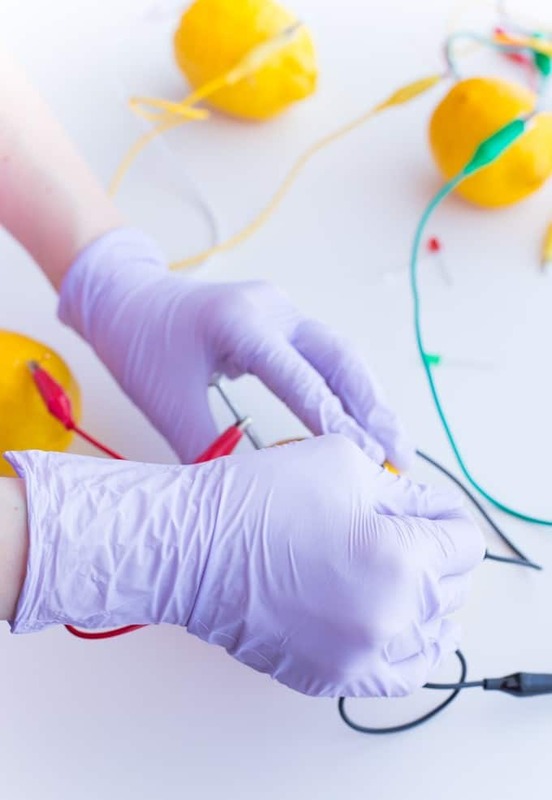 Turns out, it’s the citric acid in lemons and its oxidative power that makes amazing things like this lemon battery happen. It’s also a big reason why they work so well in Green Works cleaning products as one of the key ingredients. 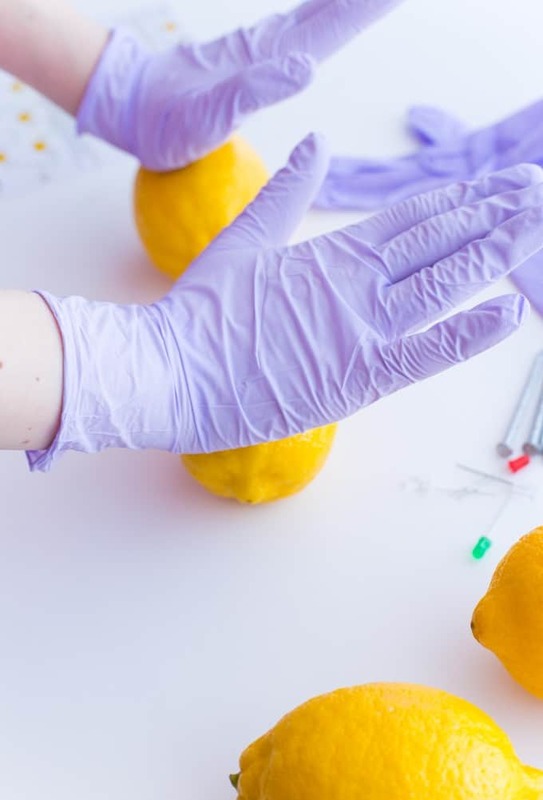 I have a newfound respect for lemons after working with Bridget on this experiment! 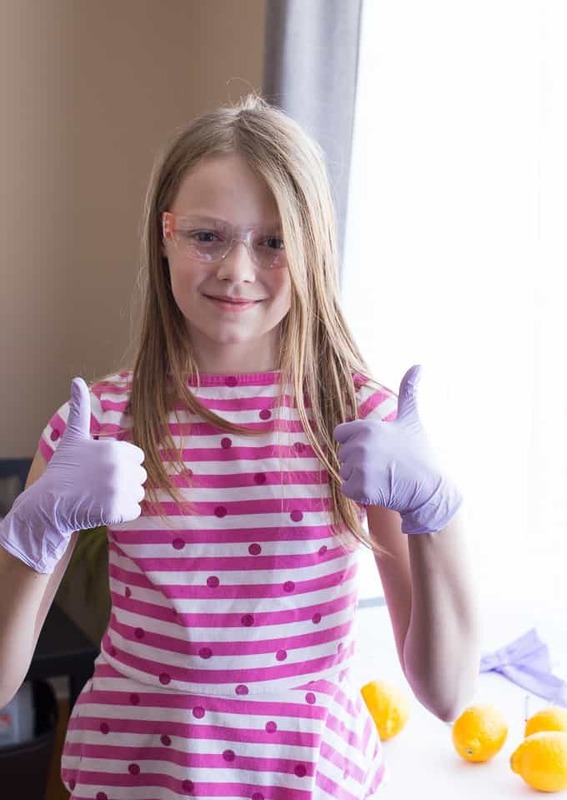 Ready to have some science fun in your home too? 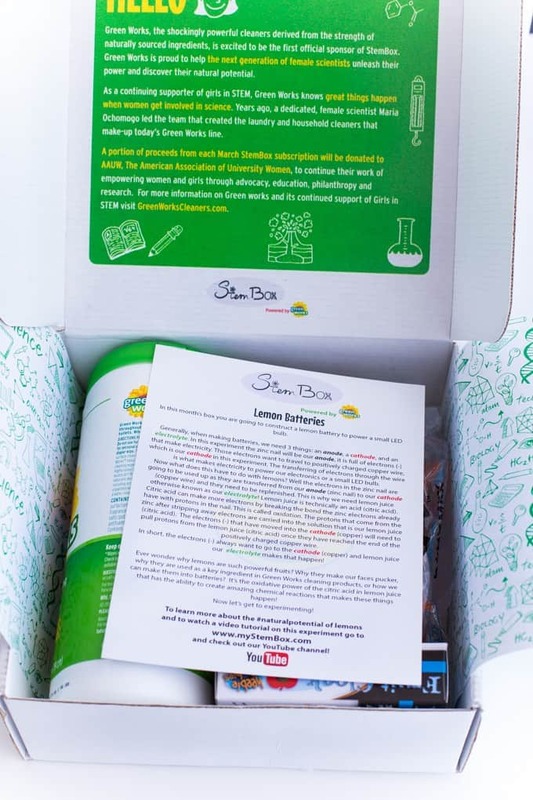 Get a StemBox subscription! They are $36/month, $88 for 3 months or $170 for 6 months. Currently, they only ship in the USA, but if you subscribe to to their newsletter, you’ll be first to know when they begin to ship internationally. A portion of the proceeds from each March Green Works StemBox subscription will be donated to AAUW, The American Association of University Women. They work to empower women and girls through advocacy, education, philanthropy and research. This experience was fun, unique and educational. I think it’s a fabulous way to spark interest in STEM and encourage you to check it out for your own children.